Prior to the mountain bike orienteering event at Gevaram, I had begun announcing my intention to quit doing MTBO. Having tried it for 2 years, I still don’t have the expertise or confidence to go out without a riding partner (Yuval). 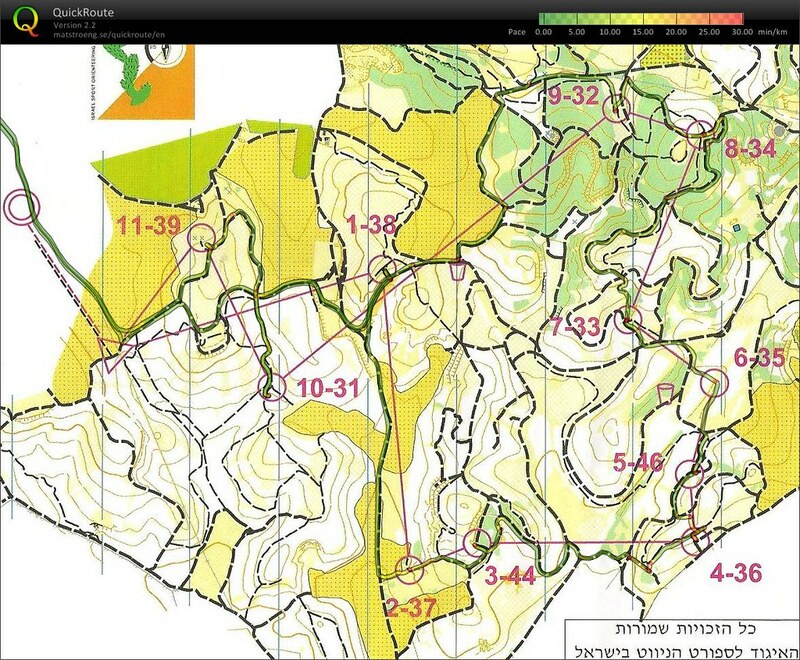 I’m happy to do MTBO in the fields of Jezreel Valley, but not in the hills of Alon Hagalil. I do not have the skills or fitness of a serious trail rider. I prefer “KKL” trails to “singles”, flat routes rather than climbs and steep descents, soft paths rather than rocky roads. Riding conditions at Gevaram were exactly the kind I prefer. I actually got to ride my bike — rather than push it — for practically the entire course. Makes me have second thoughts about continuing in the sport. 4 > 5: Started up the single, but then realized we could easily cut through the woods to the main trail below. Time wasted on discussing route choice. (~5 minutes).